Emerald Downs is coming! – Welcome to the 2019 Beemie Awards! Just a couple of weeks until one of my favorite places on earth starts racing for the summer. 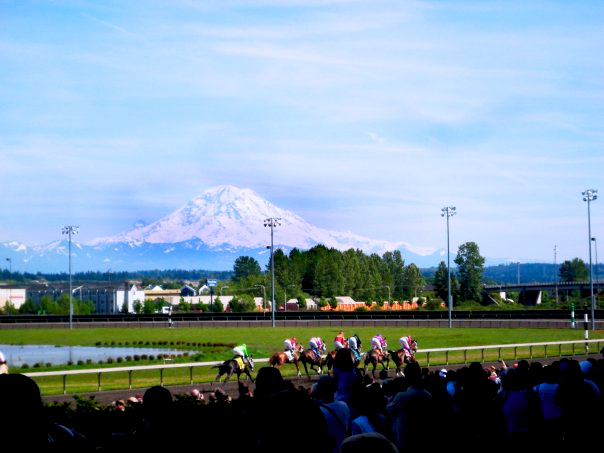 Emerald Downs in Auburn, Washington doesn’t get the national play as some ‘bigger’ tracks, but it’s a remarkably special place. Emerald Downs had the burden of trying to replace Longacres which closed in 1992 and it was a nearly impossible task. But as the track with the big green roof gets ready to kick off it’s 20th season I wanted to share some memories of why I love the place so much. Beautiful Mt. Rainier in the back drop. Emerald is home. I remember going there opening season in 1996 with my dad and buddies from my baseball team. I was 16 at the time. Over the past 19 seasons, I’ve continued to go with those same friends. Once we turned 18 (I swear we never bet before we turned 18 🙂 We would go all the time, me and my buddies. When my dad’s cancer was in it’s final stages, that was where I took him, oxygen tank in tow. We went there Friday, Saturday and Sunday that third week in July, and he died on a Tuesday. He lost $80 his last day at the track. Emerald Downs is where I got my first job in racing. I was hired to work as a turf writer and media assistant, making 10 bucks an hour and had more fun than anyone should have at a job. I got to hang out up on the roof with guys named Victor the Predictor and Ol’ Gar and Uncle Steve. I got to meet Robert Geller who was the track’s announcer. I’m obviously a big fan of announcers since I am one and Robert is always at the top of my list. He’s beyond good and his calls of so many of the races there are so memorable. A personal favorite will always be when his voice cracked when Kid Katabatic hit the line first in the Longacres Mile. He hates that call but I love it! Speaking of the Mile, i’ve watched a number of them there. My favorite is 2005 cause 50/1 No Giveaway won and I hit the trifecta for $4,900. The whole crowd was stunned and me and my friend trainer Ben Root high fived and I screamed my head off. I blew back $800 that night at the card room but that’s another story. I got to call some races there. My dad is buried on the hill above Emerald Downs and before each race I always would look up there and smile and hope he was somewhere listening. I got to do a book signing at Emerald Downs this past year and share my book Southbound with a bunch of race fans and talk to them about the story. I owned my first horses there, Bay Wide Total and Eduardo, neither of whom won. I got to meet some amazing friends there. People like Darrin Paul and his family who i’ve become great friends with. People like Dave Martin, who became a mentor of mine and was one of the sweetest men i’ve ever known. He passed away a few years ago and I still think of him when I go there. Emerald Downs is about family. And friends. And fun. And for me in my 20’s, losing a whole bucket of money. But I still love the place. Can’t wait til racing starts!